Started by public demand, we now offer a large variety of canoes and sit on top kayaks for hire. Read below or get in contact (above) to find out more. Canoe hire in Ironbridge at Shropshire Raft Tours has been established through public demand of people enquiring at our Little Green Kiosk located in the Wharfage car park by the River Severn. We serve Atcham to Ironbridge on one of the most beautiful scenic river sections in the UK. We offer a wide range of trips – from 1 hour, 2 hour to full day. We also cater for stag and hen parties, corporate team building days, and much more! We will ensure that you have a great time with your group of friends and family. Based at our kiosk in Ironbridge at the Wharfage car park. Starting in Ironbridge, we shuttle you to Atcham where you paddle back to Ironbridge. Allow 6 hours. 1 and 2 hour hire times are flexible with start times available between 9am and 3pm. For 1 and 2 hour hire, please specify in the notes when booking online your preferred hire time. We will contact to confirm your request. Our 1 and 2 hour canoe and sit on top kayak hire is based in the heart of Ironbridge. Setting off from the gravel beach behind our Little Green Kiosk, you paddle upstream taking in the beautiful peace and quiet of the stunning countryside. Look out for kingfishers, wagtails and even deer on the old power station site. After time spent paddling upstream you turn round and head back downstream. You can even head down to the great Iron bridge itself and see it from a totally different perspective before making your way back to your starting point at the gravel beach by the Museum of the Gorge. Our full day canoe and kayak hire route (6 hours) takes you from Atcham to Ironbridge. We provide transport for you from our Little Green Kiosk in the Wharfage car park (TF8 7NH) to your starting point at Atcham. After dropping you off with all the necessary equipment, you then have 6 hours to paddle your way back to us in Ironbridge, giving you time to stop along the way for a picnic lunch. We then fit you with a buoyancy aid, paddle and dry bag and finish off the paperwork stating you have paddled before. After a short safety briefing, there is a 15 minute trip in our minibus to Atcham where you are on the water for your full day on the river Severn. Take in the gorgeous scenery along the way and enjoy the beautiful wildlife of the kingfishers, wagtails, swans and deer to experience an idyllic trip returning to Ironbridge by the latest at 3.30-4pm. There are plenty of pebble beaches along the way as you pass by Cressage and Buildwas on your 15 mile trip so make sure you pack plenty of sandwiches and soft drinks! Come enjoy the birthplace of the Industrial Revolution paddling on the scenic river Severn! Beautiful countryside as you paddle through the county of Shropshire. 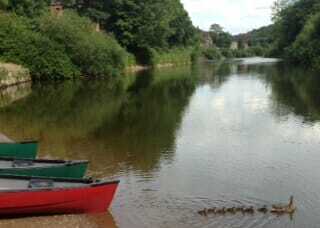 Ironbridge canoe hire at it’s best. – Boat hire (canoe or kayak). – Paddles, buoyancy aids and dry bag. – Shuttle out to Atcham for full day trips. Call us at (01952) 427 150 – What time? The safety and enjoyment of your trip are dependent on both river and weather on your chosen trip day. We will not allow any trips to proceed when severe conditions are occurring or expected. Heavy rainfall over the days leading up to your trip date affects the river levels especially rainfall over the Welsh mountains some two days before departure. Please do not hesitate to ask any questions relating to your canoes, other equipment and the River Severn. If you or any of your party have any health issues, this should be discussed first and us made aware of these conditions. In certain circumstances we may discourage you from taking part in the event. Anyone with a history of epilepsy should not participate in this activity. Maximum weight per canoe is 35 stone. Children under the age of 4 years are not allowed in canoes. Anyone under the age of 18 must be accompanied by an adult. Minimum age to hire is 18. Dogs are welcome, however under no circumstances are they to be leashed in the canoe. River Safety Cover: Please note that there is no safety cover on the river but we are contactable at all times to effect or organise a rescue. Call: 01952 427150. Mobile phone coverage: Please be aware that mobile phone coverage on the river is minimal for a lot of the major networks. Alcohol should not be consumed prior to your trip. Anyone found under the influence of alcohol or any other substances will not be permitted to hire or participate in the event. We do not allow alcohol to be taken on the river and have the right to confiscate it until you return. What to wear and spare equipment: Loose clothing. i.e. T shirts, trainers. (NOT wellington boots, flip flops or jeans). Please be aware when the sun is out it will reflect off the water making it very hot , so please dress accordingly to minimise risk of heat stroke and sunburn. Also weather conditions can change very quickly on your journey. Bring a change of clothes just in case.